There is no doubt that the main reason to choose a composite floor is its low maintenance. The woods properly treated require high costs in paints, oils, varnishes and other specific products that must be applied repeatedly during the year. 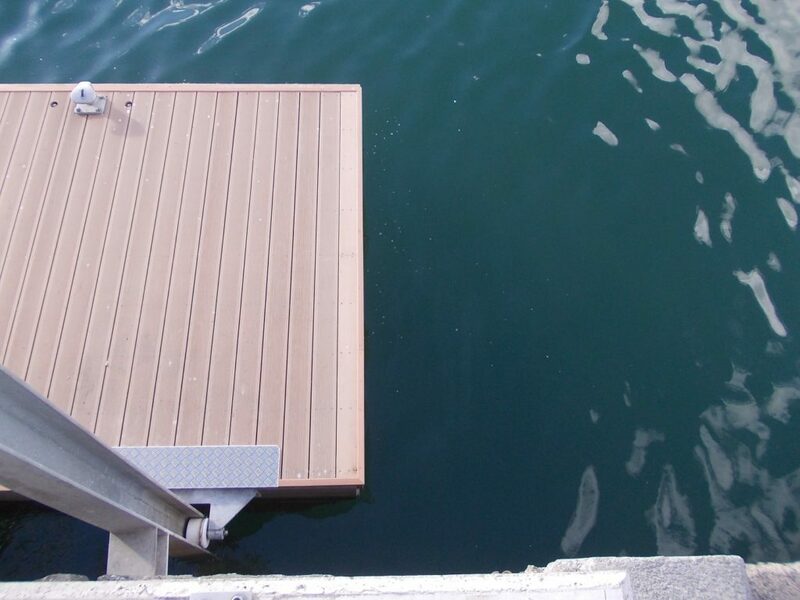 However, the composite once installed on the floating dock, after assembly, easy, fast and simple, does not need that the owners of the marina are pending to sand or apply products on the surface periodically. In addition, it is a material that does not deteriorate the structure or splinters allowing to create a more welcoming environment in which users can feel comfortable and safe. The floating pontoons are structures with a lot of passing traffic so it will be better to choose a floor with high resistance to impacts. The composite floor is the best option since it meets this requirement and offers low water absorption, high resistance to the proliferation of fungi or other insects and great protection to UV so it can be used in all types of climates. The appearance of the composite floor allows creating cozy environments with an appearance very similar to that of wood but adding the properties of plastics. The finish that is achieved is 100% natural combining perfectly in areas where the water predominates in the environment achieving the perfect union between naturalness and modernity. The colors and tones used are clear and dark: You can choose the one you like best from sand, chocolate, gray, natural or polissandro and the finishes in which it is offered are milled, smooth or engraved. The installation of this type of floor avoids the clearing of trees with what contributes to the conservation of the forests. Thanks to its composition based on organic fibers and polyvinyl chloride, it is 100% recyclable and reusable, becoming the most ecological option on the market. The price of a floating dock with a composite floor can be another option to decide. Wood has a more expensive initial cost and needs periodic maintenance to present a good appearance while using composite, you can enjoy years of service without problems as it is a material of great durability due to its high density. In addition, its assembly and installation is much faster and easier so you will save on labour.